Playing in a band is a natural next step after you’ve mastered the basics and advance your skills with music lessons. But many musicians don’t know where to begin when it comes to finding bandmates and playing as a group. If you’ve dreamed of playing in a band, but can’t find one to join, here’s your chance. Don’t waste time waiting around for the right opportunity — create your own! Follow this how-to guide to discover the secrets to starting a band and making it last! Before you can rock out shows in Phoenix and Scottsdale (any maybe even nationwide) you need to know how to play your instrument. This not only means knowing the basics like the back of your hand, it also means taking ownership of your craft and viewing yourself as the musician you are. To get there, you’ll need lots of practice, self-motivation, and guidance from more experienced musicians who know all the tricks of the trade. A great place to start for all that is music lessons, such as the ones offered at Scottsdale Music Academy. We offer voice, keyboard, drum, and guitar lessons, all of which are taught by real musicians from Scottsdale, Phoenix, Glendale, Paradise Valley, and beyond, who are eager to show you the ropes and help you reach your music goals. One of the hardest parts about forming a band is finding bandmates. 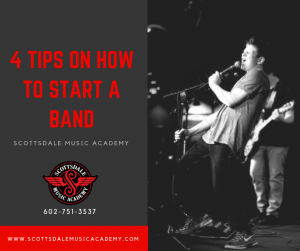 When looking for potential bandmates, use your resources to spread the word: friends, family and the people you meet at your music lessons in Scottsdale are great places to start. But don’t rely on them alone. Other great places to look are Craigslist, social media sites, and local music studios or rehearsal spaces. Lastly, don’t underestimate the powers of a good old flyer. Create something eye-catching and advertise at coffeeshops, record stores, community bulletin boards, concert venue spaces, and anywhere that’ll let you! In order to create a band with staying power, you’ll need to establish some ground rules and settle on a mission for the band. You don’t have to hash out every single detail, but major decisions should be talked about immediately. Topics that should be discussed with potential new bandmates include: where you’ll practice, when you’ll practice, who’ll be in charge of booking shows, and what your long-term visions for the band are. If all band members are on the same page from the very beginning, then there’s less chance of disagreements or fallouts in the future. Being in a band can be one of the most meaningful and rewarding experiences in your musical journey. To make the most out of it, be sure to choose bandmates you jive with and generally like. Holding auditions for new members can be a great way to feel someone out and determine if their music skills are a good fit or not. Once you’ve assembled your dream team, the last step is to decide on a name. After that, all you have to do is have fun and play your hearts out!